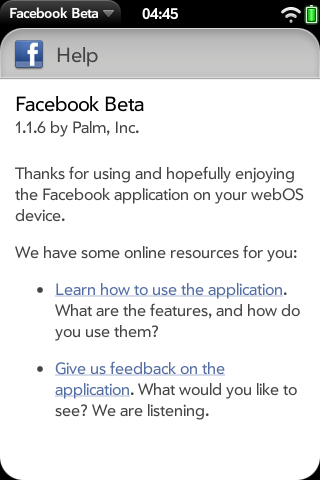 One of the greatest parts of knowing that the Palm Developer Relations team are the ones working on the Facebook app, is hearing their comments on development. 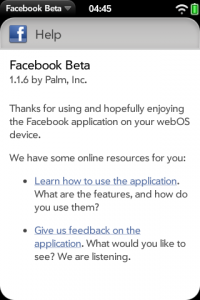 A few days ago, Palm updated Facebook on their beta feed to version 1.1.6. On the Palm Developer Center Blog, the team posted an interesting article on it. Evidently, there were 2 central issues they discovered during development, that could prove useful for third party developers to learn from. The second issue has to do with multi-stage applications and reminds developers that some old habits, like referencing the document directly, or using prototype to get a document's element, may cause trouble. The team found a few workable alternatives that will hopefully save other developers some time debugging. The Developer Relations team assist developers with issues on a daily basis. Their work on the Facebook app has been a testament to that. Makes one wonder what the future of the Facebook app may hold.